I was recently approached by my absolute favourite brand of frozen greens, 'Cookin' Greens' who threw down an intriguing challenge to me. Cookin' Greens may already be familiar to my readers. Last year, I made my Palak Paneer with their Flash Frozen Chopped Spinach, and to date, its one of the most popular recipes on The Tiffin Box. This time round, the challenge was a different one. I was very excited to hear that Cookin' Greens were going to be on CBC's Dragon's Den and to celebrate this, they contacted their favourite food bloggers (ahem!) and gave them a rather fiery task... we were to create a recipe for a Dragon, using a Cookin' Greens product. My pet dragon turned out to be internet mogul Bruce Croxon and I had to make him 'dinner' using Cookin' Greens Chopped Rapini. Yipes! Bruce turned out to be a pretty formidable challenge for this poor food blogger, but I went with my sword erm... knife, flying, and my pans all girded up. I must admit, Bruce was quite difficult. He is the public ambassador for Anaphylaxis Canada, and helps the organization raise awareness about food allergies. So my choices of what to make were pretty limited already. But the great thing was... he liked spice! Yah!! They don't call me Michelle the Dragon Slayer for nothing (ahem, again!) and I do spice like no one else! 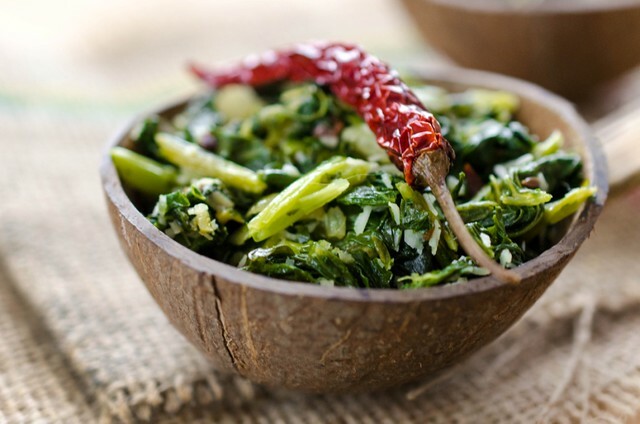 So armed with an arsenal of spices, my mum's words of wisdom ringing in my ears, I charged forth, boldly and made this delicious recipe of 'Spiced Coconut and Cookin' Greens Flash Frozen Chopped Rapini'. This dish is amazingly vegan, gluten and dairy free, but packs enough of a flavour punch to smoke any dragon out of his den. Well, you can find the recipe on the Cookin' Greens Facebook Page right here! And you can download the permalink here. This recipe is super easy, well suited to a busy Dragon who probably only has about twenty minutes to cook for his kids, right? Add rice and a spicy mango or lime pickle or two, and your meal, Indian ish-style is done! As you know from my blog, I only work with a select few brands. And Cookin' Greens are one of my favourite for a reason. They are incredibly convenient 'fast' food, just open a package and cook straight from frozen. As all their greens are flash frozen, they are also incredibly healthy, and 100% natural. They have no added salt, sugar or fat, and are a source of important nutrients such as fibre, iron, calcium, folate and antioxidant vitamins A and C. With a vegetarian daughter, and my crazy busy life at the moment, they are a veritable godsend! I usually have a bag or two (or five) in my freezer and I turn to them whenever I need a boost in flavours and freshness. 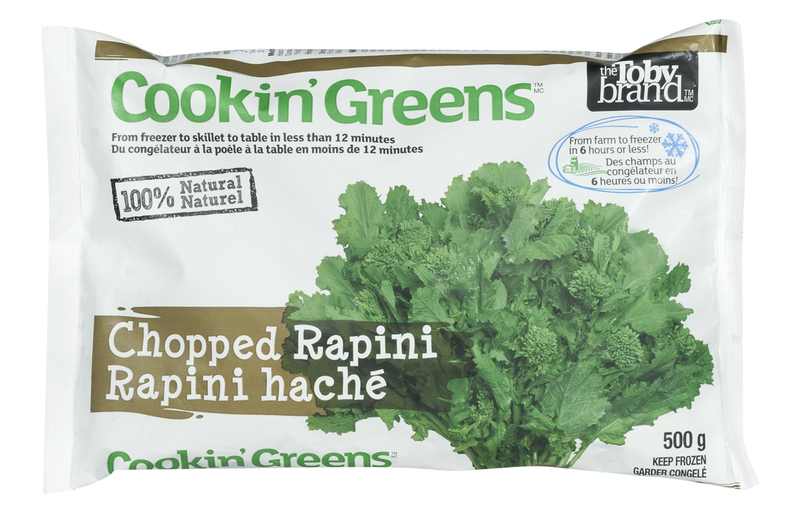 You can find Cookin' Greens in the 'Natural/ Organic' section of Superstore, pretty much every branch of Planet Organic, and several other supermarkets. Congratulations to Commenter Number 1, Neko, you've won the cooler bag and coupon. I'll message you with details! Now, to come to the exciting part of my post today! 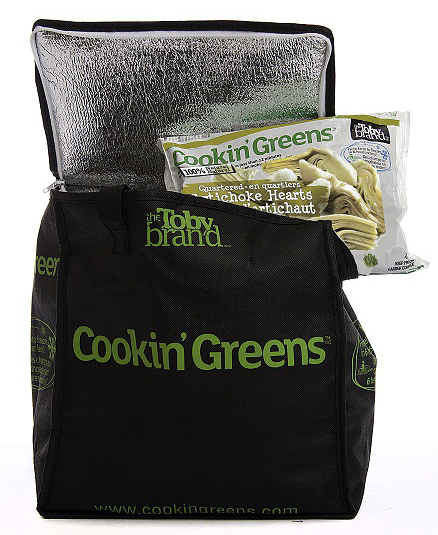 Cookin' Greens has very kindly offered me a chance to give away a coupon for a free bag of Cookin' Greens so that you can try their incredible greens for yourself, along with a cute cooler bag to carry those greens back home in. All you have to do to enter is tell me, in the comments section, what recipe you would make for my own Dragon, Bruce Croxon. Cookin' Greens would also love it if you could head over to the Pitches Page on Dragon's Den and tell them if you're IN or OUT! The page will be live on the 24th of March, after the show has aired. The Cookin' Greens Pitch will be aired on Sunday, March 24th at 8 PM EST on CBC. Join me in cheering, Go (Cookin') Greens!!! Please note, you don't have to do this to qualify for the giveaway, but it would be awesome if you could support a great brand of fresh, healthy and convenient greens. I will pick a winner at random on Monday, 25th March at 5 PM Mountain Time. This giveaway is only open to Canadian residents with a valid Canadian mailing address. Please leave me an email address with your comment so I can contact you in case you are the winner. If you comment as anonymous, please let me know what your name is below your comment. Good luck, and I can assure you that if you are the winner, you will love Cookin' Greens just as much as I do. Very cool Michelle! Big fan of Dragon's Den here. I don't have a specific recipe to share but I can see any of the greens, rapini, spinach or kale light stir fry with finely chopped garlic, ginger and chili, lightly seasoned with shoyu and sesame oil. Also in a pinch, I can see them easily used in a quiche for Sunday brunch or better yet, spinach or kale cheese scones. Certainly cuts down on prep time. I love 'fast food' that's actually healthy food, made quickly. This looks awesome! I've never tried this brand before. Let's see.. I'd make a garlic spinach stir-fry but replace the regular oil in the wok with homemade chili oil for a bit of a kick. Wow :) i love dragon's den and shark tank...love the entrepreneurial spirit that people on these shows have!.. i've never tried frozen greens before...looks convenient AND healthy.. 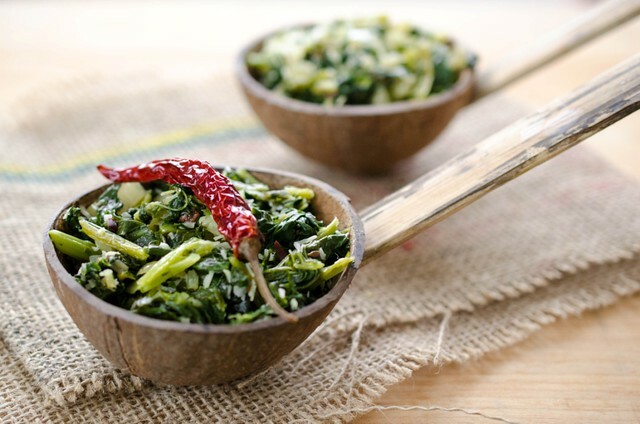 I'd love to prepare a version of palak(spinach)-chole... but may substitute kale for spinach ( to be honest, i've never really tried kale, but all this hype makes me want to try some ;) ) and palak-chole is according to me the best choice... you can spice it up or make it rich and creamy so that the spices are subtle. I would make my mom's bhajji (Spinach with Channa ki Daal) for your dragon! Love Cookin' Greens..
My choice would be a strawberry banana smoothie with chopped frozen spinach thrown in. It is easy, nutritious, and very tasty. Perfect for a busy morning! Good luck Cookin' Greens. For a dragon, you have to go fire against fire. Fettucine with spicy Italian sausage,shaved fennel, onions, olive oil, plenty of garlic and Cookin Greens Kale. I think I would make a nice soup with pasta and maybe some chicken and of course a lot of spinach. Because dragons love spinach! I would give him tea to calm him down.